Today I finally had a bit of time to upload some pictures from the Côte de Granit Rose or Pink Granite Coast in Northern France. This spectacular part of the cost line in Brittany is dominated by huge granite rocks that very often shine in a pink color. I was very lucky with the weather when I was there on October 27, 2014. Please go to my gallery for the pictures. The abbey of Mont Saint-Michel is probably one of the most iconic buildings in France. More than 3 million visitors come to Normandy to see the bay of Mont Saint-Michel, the fortified village and the abbey on top of the hill. For me it is a very magical place. I cannot really explain it but the combination of location, stunning architecture and the sea/wind make it so interesting for me. This city in the Belgian province of West Flanders was so far my definitive highlight. I had very high expectations – but they were actually surpassed when finally arriving there. During my short stay in Utrecht I have noticed two interesting things. Unfortunately the weather was really bad. Otherwise I probably would have stayed longer. 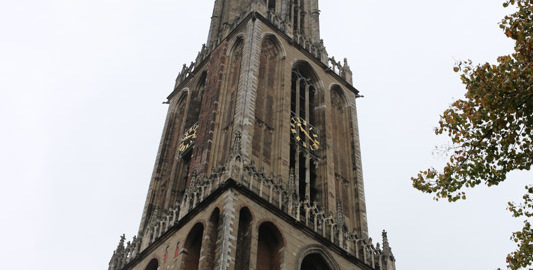 Utrecht is about 40 minutes south of Amsterdam and has grown to be the fourth largest city in the Netherlands. This was probably my third visit as a tourist to the old imperial city of Aachen. I really like the old town with the amazing cathedral. It is a masterpiece of architecture and art. Since its construction around the year 796 it has been the crowning church for 30 German kings and has seen many wars. It seems to be somehow driven by my previous work that I have some interest in gas stations. So I used the opportunity of driving through Luxembourg to briefly stop at two of the largest retail stations in the world. The castle of Ronneburg, about 25 km outside Frankfurt, is a remarkable building. It lies on top of a lonely hill and is both impressive in size and layout. To pay for its renovation and ongoing maintenance the castle is often the location for medieval festivals or markets. I am currently finalizing my preparations for the move from Switzerland to Germany. Also I am preparing the planed travels afterwards. I had an apartment in Zug for almost three years. The city is very international, foreigners are almost the majority.